(MINNEAPOLIS, Minn.) -- NEWS: Looking beyond the sharks and manta rays that catch the eye of visitors, researchers find great conservation potential in the wealth of fish and corals residing in the world's zoos and aquariums, says Species360 Conservation Science Alliance. A study published this week in Journal for Nature Conservation (April 2019) reports that aquariums hold 21 percent of the coral species that are Vulnerable to Climate Change (VCC), Evolutionary Distinct (EDGE), and assessed by the IUCN Red List of Threatened Species™ (IUCN RL). In the study, Species360 Conservation Science Alliance researchers, in collaboration with the IUCN Species Survival Commission (SSC), the Interdisciplinary Center for Population Dynamics at the University of Southern Denmark, Stellenbosch University, and the Zoological Society of London, evaluate conservation potential of 3,370 fish and coral species residing in 594 aquariums that share real-time data worldwide using the Zoological Information Management System (ZIMS). "Our study shows an important representation of species diversity in institutions where managers and scientists are recording observations ranging from reproduction to environment. Access to real-time information about populations of vulnerable and evolutionary distinct species makes it possible to identify whether 'backup populations' exist that can help conservation efforts in situations such as the current coral reef crises." "Facing issues of such magnitude as changing climate, ocean acidification and over-fishing requires the conservation community to work together to strategically decide which efforts we must focus on and how to best save species. Experts within the zoo and aquarium community have vital roles to play in the success of these conservation efforts. This study shows the value in different sets of data combining to highlight where the greatest needs and opportunities lie for us to work together." "The dramatic declines in coral reefs globally are of grave concern. As the world grapples with how best to respond, the vital conservation roles of aquariums and zoos become increasingly clear. Building and maintaining such biodiversity 'safe-houses' provides a backup plan against increasingly extreme and unexpected events, as well as against the declines that growing threats like climate change and habitat loss bring. They also bring us fascinating glimpses into creatures' lives which we might never have in the wild." "From this study we were able to identify that more than half of the coral species dying off the coast of Florida are in aquariums. These populations can provide critical knowledge and hope for re-introductions when the threats are controlled." "The ZIMS database enables the Zoological Society of London's two Zoos to directly contribute insight to conservation efforts across the globe. The data captured here allows the zoological community to more easily share information and to track and measure vast conservation efforts. The ZIMs database has played a key role in our conservation efforts of fresh water fish through international collaboration and communication." The paper has been published in the Journal of Nature Conservation led by Dalia A. Conde, Director of the Species360 Conservation Science Alliance, member of the IUCN Species Survival Commission's (Thereafter IUCN-SSC) Conservation Planning Specialist Group and Rita da Silva, Research Fellow of Species360 Conservation Science Alliance and PhD Student, Both Dalia and Rita academic work is at the Department of Biology and the Interdisciplinary Centre on Population Dynamics (CPop) at the University of Southern Denmark. Authors include: Wendy Foden, Global Change Biology Group, Department of Botany and Zoology, University of Stellenbosch, South Africa, South African National Parks, and Chair of the IUCN-SSC Climate Change Specialist Group; Paul Pearce-Kelly, Senior Curator of Ectotherms, Zoological Society of London, and Member of IUCN-SSC Climate Change and Conservation Planning Specialist Group and; Meredith Knott, Product Owner, Aquatics and Husbandry at Species360, and Member of the IUCN-SSC Otter Specialist Group; and Brian Zimmerman, Chief Curator at Zoological Society of London (ZSL). 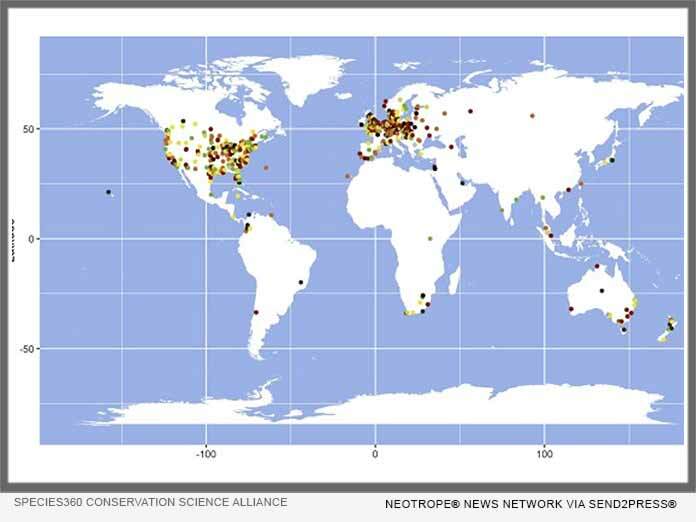 OPEN DATA from the study is available at Species360 Conservation Science Alliance, and the original paper is open access and can be downloaded here. Species360, a non-profit NGO and global leader in wildlife care and conservation, supports a growing membership of nearly 1,200 aquarium, zoo, university, research and government entities on 6 continents and in 96 countries. Working together, these institutions have built the world's largest database of wildlife knowledge, the Zoological Information Management System (ZIMS). Conservation Science Alliance sponsors and partners include Copenhagen Zoo, the World Association of Zoos and Aquariums (WAZA, and Wildlife Reserves Singapore. This version of news story was published on and is Copr. © eNewsChannels™ (eNewsChannels.com) - part of the Neotrope® News Network, USA - all rights reserved. Information is believed accurate but is not guaranteed. For questions about the above news, contact the company/org/person noted in the text and NOT this website. Tabitha Angel Berg is an aspiring author and musician and joined eNewsChannels in Nov. 2006 as an editor and mistress of the WP-based content management system (CMS). She likes ferrets better than cats and tea better than coffee, and is a devout iPad evangelist. Nobody pays her to like Dr. Pepper, but wouldn't you like to be a pepper, too? Copr. © Neotrope® USA - all rights reserved.